← Would You Shop on Thanksgiving? Have you ever walked down the cleaning aisle in the grocery store and just looked at the hundreds of products? Among the sea of brightly-colored labels, you know there is a bottle, spray, or wipe that will clean and disinfect your kitchen and/or bathroom. But which one should you choose? It has been my experience to buy one product that does everything. Fewer bottles equals less money to spend. All good, right? Well, maybe. Buzz words like “biodegradable”, “renewable”, “sustainable”, and “reusable” have quickly permeated the colloquial lingo in the last couple of decades due to increased demand by environmentally-conscious consumers. In response, major cleaning brands have been reformulated to contain more environmentally safe ingredients. Still, the biodegradable products generally cost more than their original formula counterparts. But I am here to tell you that you do not need to spend big bucks on cleaning products to help the environment. After doing a little research (i.e., read an issue or two of the latest home magazine), I discovered that there are products in my kitchen that do the same job as these major cleaners, but cost less money. Not only are these products food-safe, but they are also environmentally friendly. Bonus! 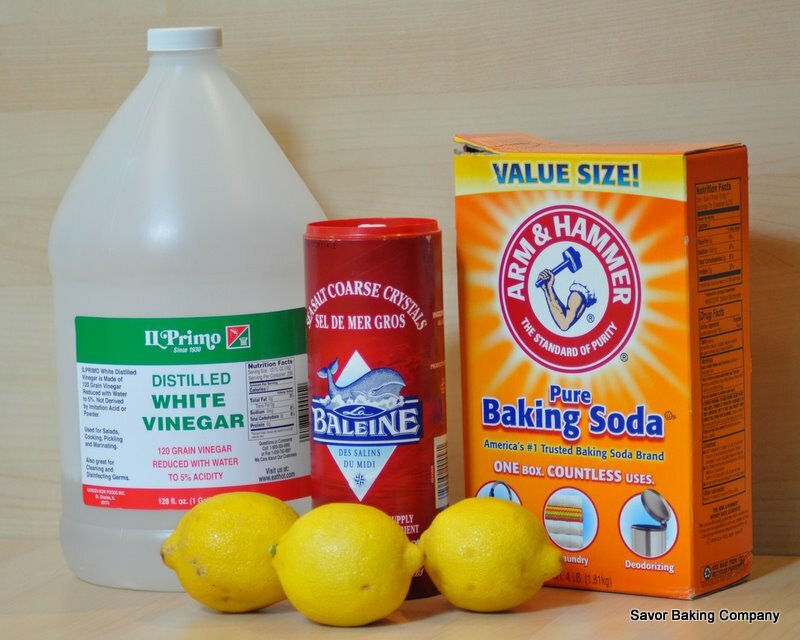 The amazing “super cleaning” products are baking soda, lemon, salt, and vinegar. Yes! You read that right! Of course, these super cleaners are readily available in any grocery store. And, they are typically sold at a fraction of the cost of commercial products, which is great news to those who are tightening budgets in the current economy. The powers of each of the super cleaners has been chronicled elsewhere, and there are plenty of websites devoted to the topic. So I have listed below ten of my favorite uses (please feel free to share your favorite uses as well) for each of the super cleaners and some helpful sites for exploring the uses of each of them. Happy cleaning! Spray vinegar on shower doors with hard water stains and mildew. Wait 5-10 minutes, then clean with light scrubbing and water. Remove tea and coffee stains inside mugs by rubbing salt over them. Clean drains in the kitchen and bathroom by pouring baking soda and vinegar down the sink. Wait 30 minutes and then flush with very hot water. Make a paste of equal parts vinegar and salt to clean tarnished brass, copper, and pewter. Clean the microwave with light scrubbing using a damp cloth and baking soda. Remove the smell of onions from hands with a lemon wedge. Disinfect a cutting board with a spray of vinegar and/or rub of a lemon wedge. Pour a salt brine down kitchen sink drains to prevent greasy buildup. Use 1/2 cup of lemon juice in the wash cycle to brighten whites. Make a paste of baking soda and 3% peroxide as an alternative toothpaste. This entry was posted in Low-Cost Tips, Organization, Savor Tips and tagged around the house, baking tips, bathroom, budget-friendly, cleaning, how-to, kitchen, organization, tools of the trade. Bookmark the permalink.